This third row, 6 bedroom/6.5 bathroom pet friendly home features a spacious deck and private pool!. This home is located in beautiful Burke's Beach and is just a three minute walk to the beach! Experience its luxury with brilliant hardwood floors, high ceilings, extensive crown moldings and beautiful marble, stone, and granite used lavishly throughout. This home is definitely one of a kind and is a perfect for any vacationer! We also manage the neighboring homes at 1 Sandy Beach Trail and 5 Sandy Beach Trail which is perfect for large families and group gatherings. Free Activities Included! Play a round of golf, enjoy a dolphin cruise, explore Hilton Head on bicycle and even bring out your inner kid with a round of putt-putt golf! To enhance your vacation experience, Vacation Homes of Hilton Head includes our signature Southern Hospitality Pass, which means all of the above activities are FREE. Contact us today to learn more about the free fun included with this Vacation Homes of Hilton Head rental! 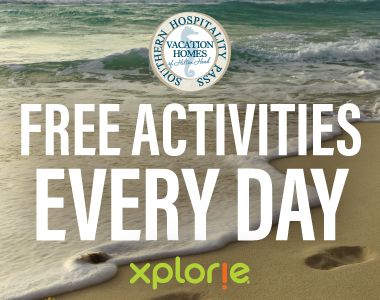 (1 pass for each activity per group, passes expire daily. 1 bicycle per reservation). To secure a reservation, we require a 50% deposit upfront and the balance payment due thirty days prior to arrival via *E-Check (*domestic accounts only) or Visa, Master, Discover or American Express card. Manager response on 2018-10-18 - Response from Vacation Homes of Hilton Head, Inc.
Hi Veronica, thank you so much for your feedback! We are glad to hear that everyone enjoyed their stay. We hope to see you soon for your next visit! Great time at the beach!!! Manager response on 2018-07-14 - Response from Vacation Homes of Hilton Head, Inc.
Hi Barbara, thank you for writing us a review. We are glad to hear that you and your family enjoyed the many bathrooms and the second refrigerator in the laundry room. We hope to see you soon for your next stay. We very much enjoyed our week on Hilton Head Island. There were 16 of us ranging in age from 2 to 67. The house was situated perfectly for us. Close to the beach and all the activities and restaurants we love in HHI. The children really enjoyed the swimming pool and the parents were happy that they could keep a watchful eye on them from the main living area of the house. The layout of the house was great for us. Plenty of room for everyone. Our only complaint were the beds. The mattresses need to be replaced. However, overall we were very happy with the house and would like to stay here again. Manager response on 2018-07-10 - Response from Vacation Homes of Hilton Head, Inc.
Hi Margaret, we are glad to hear that the house perfectly fit your big party. We were unaware about the issue of the mattresses as we hadn't heard anything from your group during your stay. The owner is looking into updating the house during the off season. Thank you for writing us a review and we hope to see you for your next visit. I was very pleased with the outcome of my visit I would definitely reserve it again. The house was absolutely beautiful. We loved how you could smell the fresh salt water from the beach and the walk wasn’t even 5 mins! It was a great experience and would definitely do it again. Manager response on 2018-03-20 - Response from Vacation Homes of Hilton Head, Inc.
Hello Illene, Thank you for your positive feedback. We are pleased to hear that you enjoyed the home and its close proximity to the beach and we'd love to have you all again in the future! The house was more than we had hope for. It housed 6 couples very, very comfortably. With Every bedroom having its own bathroom WAS A GREAT FEATURE. The location was perfect. Not too far from anywhere on the island. The beach was just a short walk down the road. The only question everyone had was "When are we coming back?" Manager response on 2018-03-08 - Response from Vacation Homes of Hilton Head, Inc.
Hi William, Thank you so much for your great feedback and taking the time to leave us a review! We are so pleased to hear that you enjoyed your stay with us at 4 Sandy Beach Trail and we would love to have you guys again in the future. Remember that you are entitled to a discount for being a repeat renter and we hope to see you again soon! Wonderful house, everything we could want, close to the beach,a beautiful pool and patio. Manager response on 2017-07-16 - Response from Vacation Homes of Hilton Head, Inc.
Hi Patricia, Thank you for your feedback. We are happy that you enjoyed your stay at 4 Sandy Beach Trail. We hope to have you again next summer! Property management team at Vacation Homes of Hilton Head did an excellent job supporting us in the very few issues we had with the house. They were prompt, and did what they said they would do. The property is in a great location and is ideal for a large family. Manager response on 2017-06-27 - Response from Vacation Homes of Hilton Head, Inc.
Hi Ralph, Thank you for leaving us a review. We are happy that you enjoyed your stay with us and we are happy to hear that our staff was of assistance to you as we strive to offer prompt and quality customer service. We hope to have you again next summer! Pros: Close to the beach with spacious accommodations that are adequately maintained. Also, the Hilton Head Island Vacation staff was professional and accommodating. Cons: The swimming pool area should be enclosed (fenced in), and a linen closet with extra pillows, linens, and towels would be nice. Manager response on 2017-11-27 - Response from Vacation Homes of Hilton Head, Inc.
Hi Peter, We are happy to hear that you enjoyed your time here in Hilton Head! We will look into the recommendations that you suggested as well. We hope to have you again next year! Manager response on 2017-07-30 - Response from Vacation Homes of Hilton Head, Inc.
Hi Philip, We are sorry that this happened and we appreciate all of your patience while we got everything squared away for you and your family. We are on call 24 hours so we are always available to our guests for any after hour emergencies and we try to respond as promptly as possible. We are happy to hear that you were pleased with our services as well as the cleaning company. We do hope to host you all again on your next visit to Hilton Head! Great place to stay with plenty of room and easy access to the beach. Manager response on 2017-10-13 - Response from Vacation Homes of Hilton Head, Inc.
Hello William, We are happy to hear that you enjoyed your stay with us and thank you for taking out the time to leave us a review! We hope to have you again in the future! Fantastic location, great family reunion house! This house was a great place to stay for our group. The access to the beach is fantastic and the house is quick drive to many places on the island. Would definitely rent this house again! Manager response on 2017-10-19 - Response from Vacation Homes of Hilton Head, Inc.
Hi Beth, We are happy to hear that you enjoyed your stay at 4 Sandy Beach Trail and we'd love to have you all again in the future! We were very pleased with all aspects of this rental property. Manager response on 2018-02-08 - Response from Vacation Homes of Hilton Head, Inc.
Hi Lewis, We are pleased to hear that you all enjoyed your stay at 4 Sandy Beach Trail and we hope to have you all again next year! The house is beautiful, spacious and have everything we need. Huge dining and entertainment area on the first floor. Very well appointed throughout the house. All the bedrooms are good size. The beach is only a short walk away. The management company is very professional, and respond to our questions in a timely fashion with great customer service. Manager response on 2017-04-04 - Response from Vacation Homes of Hilton Head, Inc.
Hello Xiaohu, We are so happy to hear that you enjoyed your stay with us! We are big on guest satisfaction so this is always good to hear thanks for your review and we hope to host you and your family again soon! The house was clean and comfortable. We enjoyed paddleboarding and parasailing. The beach was a 6 min. walk and we went everyday because we had beautiful weather. We enjoyed Frankie Bones Restaurant, Il Carpaccio Restaurant and of course, Pino Gelato. My family loved the vacation. Manager response on 2017-06-06 - Response from Vacation Homes of Hilton Head, Inc.
Hi Rita, Thank you for sharing your experience with us! We are happy to hear that you enjoyed your time here in Hilton Head. It looks like you also got to enjoy some nice restaurants! There is definitely no shortage of dining options here on the island. Thanks again for leaving us a review and we hope to have you again next year! © 2019 Vacation Homes of Hilton Head All rights reserved.